Try the above method again a few days later, and you may have more success. The aim is to encourage the black ‘plug’ blocking the pore to come up to the surface of the skin and eventually ease it out completely. 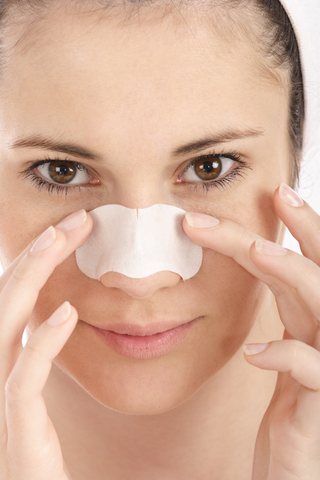 Pore strips are useful for blackheads on nose, and care should be taken to follow the instructions provided. If you have very sensitive skin, do not use pore strips as they may irritate your skin. Take care when removing the strip from your nose; if it seems to be difficult to remove, add water and take your time. If you experience pain or discomfort, stop using the strips immediately. Unfortunately, there are no miracle cures, although many products will claim that using them will solve the problem straight away. Keeping excess oil from the skin is the only way to clear your skin of these annoying black spots and stop them from appearing in the future. It may take a little time before you see results, but it will work. Now that you have some tips on blackhead treatment that will really work, is only a matter of time before you have clear, blemish-free skin. Great tips, I normally use pore strips to keep my nose nice and clean. thanks Tom, did you check out our article on three tips for getting rid of blackheads on nose (including pore strips)?